We’ve been in Nashville as a family for just a little over one week now. Coco’s jetlag is fading away. Mine still shows in bits and pieces as I wake up at 3 in the morning. Charina’s still shows a bit, but she and Coco are getting along just fine in our apartment. We’re settling down for sure. The house is all tidy now. We still need quite a few things like an oven toaster, but our Sola promised to give us one. Yay! And we also got a nice Welcome Rug that screams a loud Southern “Hey y’all” for any visitor that will come a-knocking soon, thanks to my colleague Lee Ann. 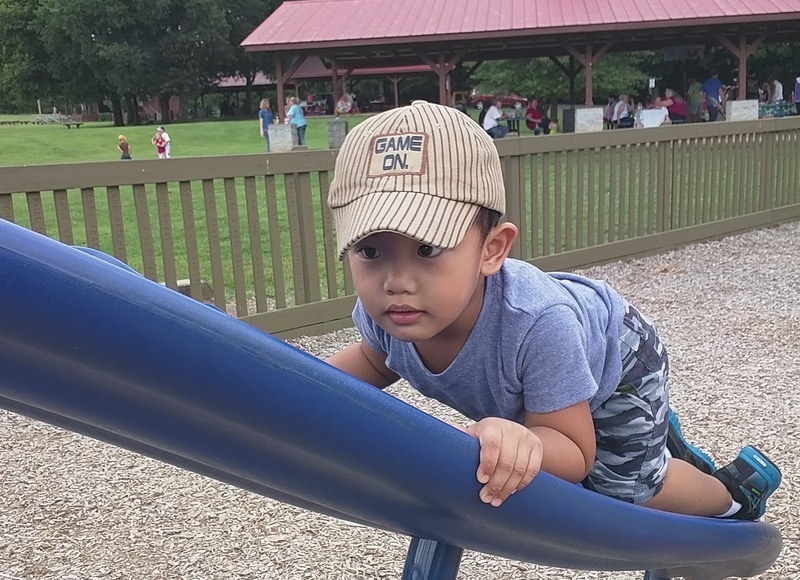 Last Saturday, we went to the playground at Charlie Daniel’s Park in Mt. Juliet. And boy, Coco loved every single bit of it! Too bad it rained later in the afternoon. We also finally bought (more like loaned) a new car — it’s a 2012 Kia Forte LX. In most cities in the US, you definitely need a car to move around. There are buses and trains but you’re at the mercy of their schedules and routes. There are no jeepneys and tricycles, and definitely no pedicabs. But Uber is available, although it could be an expensive daily commute option. It was not easy buying a car. Our first car was second-hand Diesel-engine 1998 Mitsubishi Adventure, which I got from my brother-in-law. I didn’t really shop around for it. For our Forte, though, I went to three dealerships and did some kind of negotiation, and looked at my financing option. Would you believe that I had been offered 23% interest rate? I would have paid more than $400 per month for 60 months! It was crazy. Thankfully, the Credit Union where I opened an account offered me a way better deal that allowed me to buy a car. We also needed to bring Coco to a doctor last Thursday. He was having his asthma attack and we ran out of his Salbutamol Ventolin inhalation solution. It turns out that Salbutamol isn’t available in the US, and you need a prescription to get the alternative medicine: Albuterol. You also couldn’t just walk in at a clinic, though I was told that there are now what they call “Little Clinics” that allow you to do that. So I had to schedule a doctor’s appointment, which went quickly, thankfully. After our doctor’s appointment, the Doctor wrote a prescription. But we didn’t get a paper prescription. Instead, I found out that the prescription goes directly to your pharmacy of choice, you show up at the pharmacy, pickup your medicines, and pay up. Doctors and pharmacists probably don’t need to learn how to write in Steno here in the US. We used to have a helper and a nanny back in the Philippines. My wife worked at a TV network and since she has a flexible schedule, she also managed to spend some time with Coco. But because of visa restrictions, she couldn’t work here in the USA. That’s why being a 24/7, Full Time Nanay also takes getting used to. New routines, new schedules, a lot of things are so new, it sometimes feel overwhelming. I’m sure there’ll be more things to discover in the coming weeks and months. While it is challenging, I welcome the change and the opportunity to learn new ways of doing things.